Learning how to make paper beads is a great way to create affordable jewelry that is good for the planet. In Victorian times, women would make beads from scraps of wallpaper and string them together to make curtains for their rooms. Today, however, paper beads are most often used as the basis for funky handmade bracelets and necklaces. You can make beads from wrapping paper, patterned scrapbook paper, origami paper, or magazine pictures. Since this craft is so simple, feel free to experiment until you find a combination that produces the desired look. To begin making paper beads, cut your paper into strips. The exact size doesn't matter, but keep in mind the size will affect how large your finished bead will be. Triangles will produce beads with a rounded appearance, while straight strips will result in barrel beads. Cover the back side of the paper strip with paste or decoupage adhesive. Carefully wrap the paper around a drinking straw, pencil, or knitting needle. Repeat as needed to make enough beads for your entire project. If you are worried about the beads getting wet, seal them with a coat of decoupage adhesive, varnish, or UTEE. When your beads are dry, string them on clear stretch cord to make a pretty bracelet or necklace. To vary the look, mix your handmade beads with beads purchased from your local craft store. 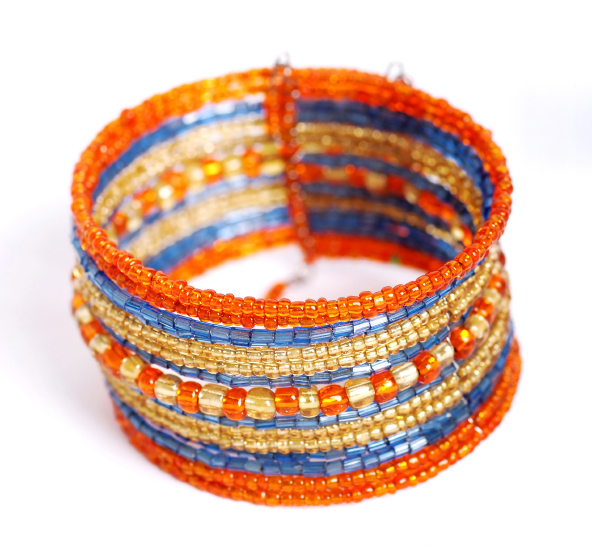 For more beading ideas, check out the LTK Crafts tutorial on How to Make a Bead Bracelet.